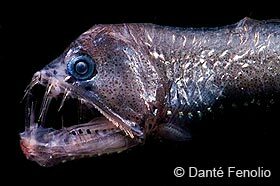 The viperfish is one of the most unusual-looking fish in the deep sea. It is also one of the most popular and well-known species. 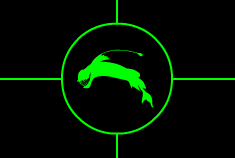 Known scientifically as Chauliodus sloani, it is one of the fiercest predators of the deep. This fish can be easily recognized by its large mouth and sharp, fang-like teeth. In fact, these fangs are so large that they will not fit inside the mouth. Instead, they curve back very close to the fish's eyes. The viperfish is thought to use these sharp teeth to impale its victims by swimming at them at high speeds. The first vertebra, right behind the head, is actually designed to act as a shock absorber. This fearsome looking creature has a long dorsal spine that is tipped with a photophore, a light-producing organ. The viperfish uses this light organ to attract its prey through a process known as bioluminescence. By flashing the light on and off, it can be used like a fishing lure to attract smaller fish. In spite of its ferocious appearance, the viperfish is a relatively small animal, growing to about 11 or 12 inches (30 centimeters) in length. It is usually dark silvery blue in color, but its coloration can vary from green to silver or black. Although the main light organ is located at the end of the elongated dorsal fin ray, there are also several photophores located all along the side of the fish. These may help to camouflage the fish from predators lurking below. These lights make its bottom side appear to blend in with the extremely faint light filtering down from above. They may also serve to attract prey and communicate with potential mates or rivals. The unusually large teeth of the viperfish help it to grab hold of its prey at it hunts in the darkness. Viperfish have been observed hanging motionless in the water, waving their lures over their heads like a fishing pole to attract their meals. They have a hinged skull, which can be rotated up for swallowing unusually large prey. They also have very large stomachs that allow them to stock up on food whenever it is plentiful. Viperfish feed primarily on crustaceans and small fish. Like many deep-sea creatures, they are known to migrate vertically throughout the day. During daytime hours they are usually found in deep water down to 5,000 feet (1,500 meters). 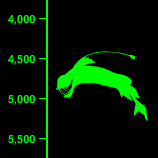 At night they travel up to shallower waters at depths of less than 2,000 feet (600 meters) where food is more plentiful. Viperfish have a very low basal metabolic rate, which means they can go for days without food. This adaptation is likely a result of the scarce nature of food in the deep sea. Viperfish are known to be preyed upon by sharks and some species of dolphin. Because of the extreme depths at which they are found, very little is known about the reproductive habits of the viperfish. It is believed that they are external spawners, meaning that the female releases eggs into the water to be fertilized. Spawning probably occurs throughout the year, although the numbers of young larvae have been discovered to be highest between January and March. These larvae are approximately six millimeters long (approximately a quarter of an inch) when they hatch. They are left to fend for themselves until they can reach maturity. Not much is known about the life span of the viperfish, but most researchers think they live between 15 and 30 years. In captivity, they rarely live longer than a few hours.